Since organizing my studio space for Creatively Anew it has been so much easier to find things instead of rummaging through everything a million times looking for the item I want to use. 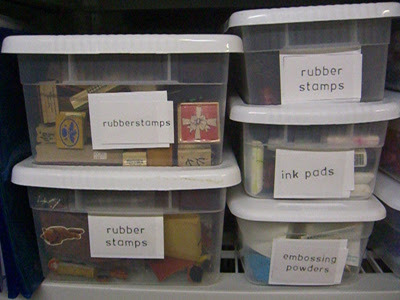 Using clear plastic containers that are labeled and shelves I have finally organized my work space and get more artwork done. 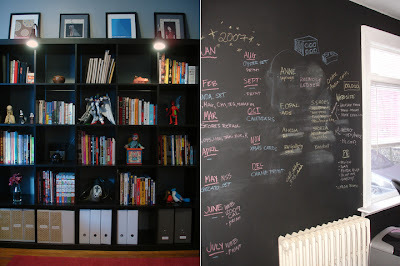 Jennifer Hill of JHill Design has some great ideas, "First a HUGE wall covered in chalkboard paint helps in the office. Then our desks are hollow wooden doors on file cabinets, cheap, long and lots of storage. We have two Ikea cubby shelves that are great for putting books, magazines and such away - but keeping it accessible." 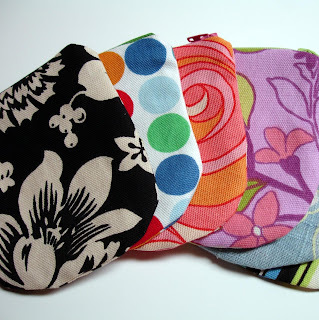 Katy of Muchacha K Handmade says, " I can't claim to be an organizational genius, but I know a good idea when I see one. I totally stole the 'Jay McCarroll' method of fabric storage from Project Runway. You know the episode where they went to his house and he has all the cubbies of fabric with all the fabric organized by color? In my apartment in California I had an entire closet dedicated to fabric and sorted by color. And when I opened my studio last month here in New England that's exactly what I did again. It's not only visually satisfying, but it serves practical purposes as well. When clients want to pick fabrics they are usually brides and they always know what colors are either going to be in their wedding or are preferred by their bridesmaids. It's easier for them to see what I have if it's pre-sorted by color. It also makes my life easier when I'm trying to pair up certain color combinations." Jessica Burko of Reclaimed To You responded by saying, "After many years of having my studio/living room/dining room/bedroom in my home I now have a work space in Boston's South End neighborhood. 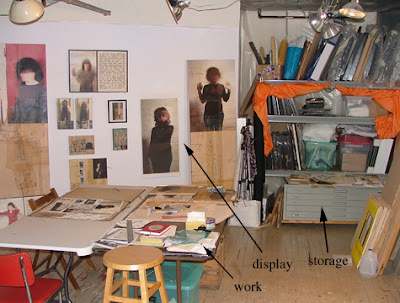 The space allows me to make a mess and not clean it up right away, experiment with smelly and sloppy materials and not worry about living with it around the clock, and best of all - in this space I have been able to spread out." "My general set-up is divided into three parts: work area, storage area, and display area. I work in the middle of the room on two large tables facing a wall where I hang finished work and work in progress - I find that while I am creating a new piece it is helpful to look up and see where I have come from and to be able to tack something vertically to step away from it for a different vantage point. The remaining three sides of the room are filled with supplies and storage of finished work. The three best tips I can give for a useable and organized studio: shelves, shelves, shelves. 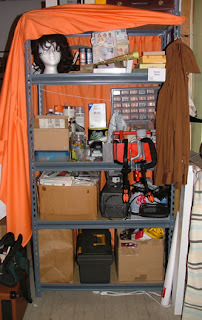 I have all of my tools, equipment, supplies, framed art, and art fair gear on two metal shelving units. Shelving is a great way to utilize the ceiling height in the space, and lets me quickly see where things are when needed. When I have events in my studio I pull down 'curtains' made of dollar store bed sheets so that all my storage is concealed." Hopefully all of these organizational methods will inspire you to try new things with your space. Great article, and a variety of spaces. Thanks for sharing them. wow, this is great! I was planning to chime in, but... oops! Anyway, I have almost everything in my studio organized in zip-lock bags. I couldn't live without them! I love looking at other people's studios! Is that Jessica's head on a pedestal? Okay, I can't stop thinking about that chalkboard wall...that's a dilemma I've been trying to solve because dayplanners and wall calendars don't work well for me, I'm better off seeing everything all at once...what a cool big picture solution.